Doctor Manhattan was created by Alan Moore and Dave Gibbons for their groundbreaking mini-series Watchmen. The mini series was originally to star the recently-acquired Charlton heroes, but DC editors decided they wanted to integrate those characters into the mainstream DC Universe. Moore and Gibbons decided on a fresh approach of characters inspired by the Charlton heroes. Of Dr. Manhattan, Moore has said the character was partly based on Captain Atom, who in Moore’s original proposal was surrounded by the shadow of nuclear threat. In a June 1988 interview with Vincent Eno and El Csawza, Alan Moore said he found he could do more with Manhattan as a “kind of a quantum super-hero” than he ever could have with Captain Atom. Moore sought to delve into nuclear physics and quantum physics in constructing the character of Dr. Manhattan. Moore believed that a character living in a quantum universe would not perceive time with a linear perspective, which would influence the character’s perception of human affairs. He also wanted to avoid creating an emotionless character like Spock from Star Trek, so he sought for Dr. Manhattan to retain “human habits” and to grow away from them and humanity in general. 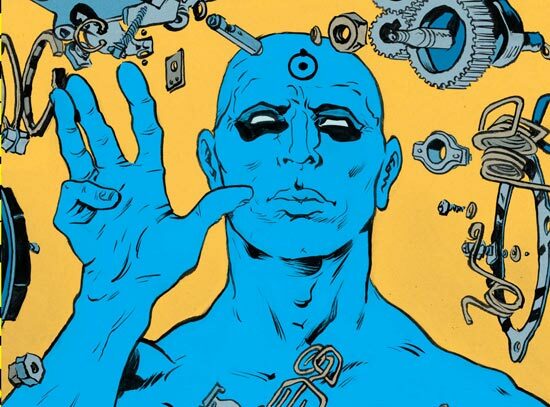 Dr. Manhattan’s powers include superhuman strength, telekinesis, teleportation, control over matter at a subatomic level, and near-total clairvoyance (though limited to events that he will directly experience in the future; Manhattan notes in a television interview that he is not omniscient). He can change the size of his body and duplicate himself at will. He perceives the past, present and future as happening simultaneously, but states that he cannot act on that knowledge since his own actions and reactions to events (as is reality itself) are predetermined; even as a human, his major actions were always influenced by others, such as him training in quantum physics because his father insisted he search for a job that would be more relevant in the future than his own role as a watchmaker. His ability to see the future can be blocked by a surge of tachyons, such as that released when Ozymandias puts the final step of his plan into action. There was a follow-up “prequel” series to Watchmen in 2012-2013 entitled Before Watchmen. Although Moore and Gibbons consider the series non-canonical, I have included it as part of this website. It is not the first time that characters were changed after given life by their creators. It is what kept Superman, Batman, and Spider-Man going for so many years. 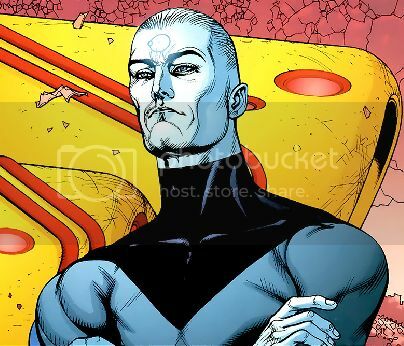 Dr. Manhattan and all related characters are ©DC Comics, Inc.